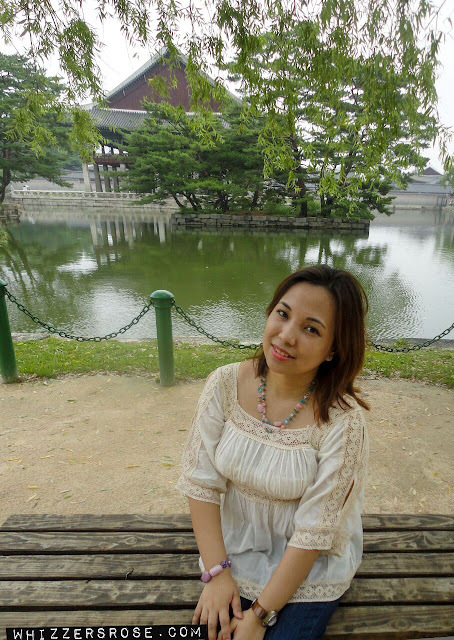 It was our last day in Korea and I told them that I plan to go the the grandest palace in Seoul, Gyeongbokgung Palace. My parents do not want to see another palace but opted to shop in Myeondong while my sister and I wandered on our own. We were leaving that night and my parents wanted to be at the airport by 4 because they were thinking they could shop at the Duty Free Stores at the Airport from 4pm- 8:00 pm when unbeknownst to them, you can only shop at the Duty Free stores once you've checked in and check-in time is 2 hours before your flight schedule. Rush shopping was never the plan. After a very light breakfast of noodles, we rode from Myeongdong Station to Changmuro Station and then to Gyeongbokgung station. Actually, the orange line passes thru Anguk Station (Changdeokgung Palace) and also you can stop by Anguk to see another Palace Unhyeongung which we opted not to see. The train ride from Changmuro to Gyeongbokgung was pretty empty. I guess we were early. I am already dragging my very tired feet. LOL! Finally we've arrived. The train station houses a museum which we unfortunately thought we didn't have the time to see, there is also a replica of the stone gates, Bullomun. The stone gates that I mentioned in my earlier post which can be found in the Secret Garden at Changdeokgung. When you emerge from the station, you're just a few seconds away from the Palace compound. We arrived just a few minutes past the hour of 10. The Palace opens at ten. Nevertheless, the compound was already bustling with activities and hordes of tourists. It was actually quite difficult to get shots without photo bombers but the most irritating thing was our cameras were running low on batteries. I was quite pissed off at myself for not charging it-I checked my batteries right before I turned it off the other day and there were 3 out of 4 bars-I guess I shouldn't have been complacent. My sister's camera wasn't also charged the night before because she thought mine would suffice and I was actually carrying 2 cameras around-that day, I opted to leave the other one behind (deym!). So most of the shots were taken by our xperia phones and of course we estimated that we have to be back at Namsan by 1pm so we could have lunch. Everything was rushed. The strategy we did was to get a copy of the Guide and browse through it, looking at places we want to see the most out of the entire Palace compound since the Palace compound is HUGE. I immediately wanted to see the Hyangwonji pond-as it is the most scenic place in the area. Too bad it was located at the rear, so more walking for us. There, a small crowd of people gathered around a girl who was painting the scenery and my sister and I took a while before shooting photos and retouched (hehehehe). It was beautiful but it was in this place when the murder of Queen Min (Queen Myeongseong) actually took place. Her death (Eulmi Inscident) was horrible. The Queen was actually murdered by Japanese assassins-from what I gathered, they stormed the Queen's quarters and dragged all the ladies out by the hair and tortured them to find out which of them was the Queen. The Queen was then stabbed to death and a lot of stories also tells how she was fondled and burned alive. Her remains were scattered in the forest behind this palace. After that, we wanted to see the Gyeonghoeru Pavillion. It is where the king threw formal banquets. So we walked again around the Palace compound was actually kind of a maze. We went into one place and then found out there wasn't an exit and so we had to go back again. We tried to do some shortcuts through quarters too and ended up in a "no entry" area. A large part of the palace is under reconstruction since the original Palace was burned down or torn down by the Japanese in the early 1900s and restoration is until now-still ongoing. After this, my sister and I decided to go back. In all honesty-aside from Hwangwonjeong and the view of Mount Bugaksan-I prefer the serene environment of Changdeokgung. I'm glad we went there first. At Myeondong Station, we tried out something that we have been curious about since we arrived. So my sister and I -in getting rid of our extra small denominations, tried this. This is a video of the train ride from the Gyeongbokgung. I really like the song that's why I did this video. I initially thought, it was made entirely of hardened icing and was compact but in fact it wasn't. When we bought one for each of us (mine's the strawberry one while my sister tried the white chocolate), the vendor placed each in a paper bag and motioned for my sister to hammer the bag. The ball of icing was actually hollow :-( -but it tasted good. After a meal at McDonald's -it was time to go. We had opted to ride the airport service of Namsan Guesthouse despite it being expensive since we didn't want to get into the hassle of waiting for the airport limousine bus. We didn't want to carry and drag our luggage down and to the other side of the road plus the weather was quite gloomy. Sad to leave Seoul. My mom says, we lacked the time.So perhaps there are still a lot to see someday if I ever get the chance to come back. The best thing of all, was at the airport where I spent 2 hours asleep I discovered we are indeed flying on Cebu Pacific's newest airbus 330-yey! Oddly, there were more Koreans who boarded our flight than Filipinos.There were also some celebrity sightings at the airport that day but none of those two-I recognized. Just that they were hounded by reporters said enough. The big JUAN is here! I was very pleased to learn that we are going to fly the newest Airbus 330 of Cebu Pacific. I felt so happy to have one of the first butts to seat on this spankin' new airplane.